sjhoward.co.uk » Throw your money at Me(ncap)! Throw your money at Me(ncap)! 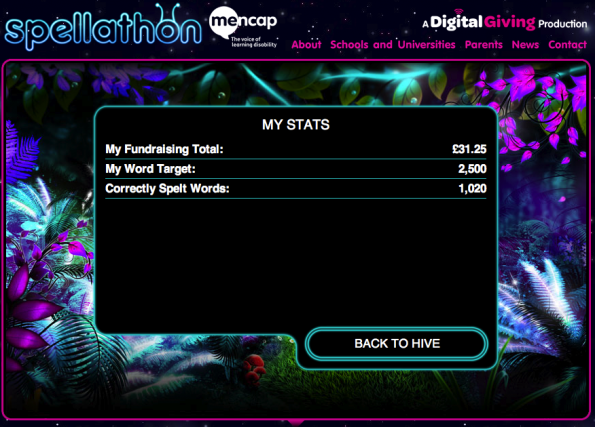 As you can see, I’m now 1000 words into my 2500-word Mencap spellathon challenge. I think I underestimated how many words make 2500 – it turns out that 2500 is quite a lot. So keep sponsoring me, and keep me spelling! Mencap is a great cause, supporting the 1.5 million people in the UK with learning disabilities. If you gave me a penny for ever ten words – that’s just £2.50 – Mencap could make that go a long way. So get over to the JustGiving page Mencap have created for me, and give them some cash. This 1,523rd post was filed under: Headliner, Charity, Introspection, Spellathon.